Mustela vison (American mink) is part of the mustelid family (order Carnivora). They live alone along riverbanks and lakeshores and have been introduced to many countries to set up mink breeding farms for producing fur. 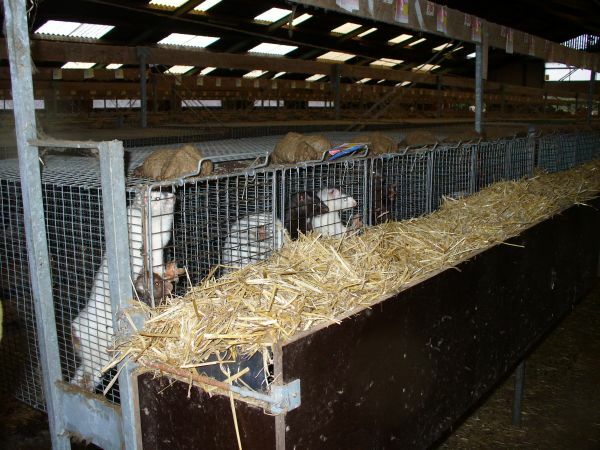 From these farms Mustela vison have consequently escaped and become naturalised in many locations. In some instances there have been intentional releases by fur farmers hoping to produce better quality \"free-range\" fur (mainly in Eastern Europe) and intentional release by animal activists. In countries where fur farms still operate, mink still frequently escape into the surrounding environment. In introduced locations the mink has proved to be an extremely competitive predator which has had a huge impact on prey populations. Mustela vison (American mink) is a member of the family Mustelidae. It is a medium-sized carnivore with an elongated body approximately 30cm long, relatively short limbs, and a tail approximately a third of the body length. Wild native American mink are uniformly dark brown but breeding in fur farms (or ranches) has resulted in a wide range of pelage colours, and consequently escaped feral mink may vary in colour from white, grey or fawn through to black (CCS Undated). Deliberate release of Mustela vison (American mink) from fur farms by animal rights activists has become a regular hazard, eg. 6000 mink were released from a fur farm in the Netherlands in 2003 (Reynolds et al. 2004). Mustela vison (American mink) mate in the spring, and young are born in the summer. Gestation is 39-76 days. Young are born blind, and females lactate for 6 to 8 weeks. Males mature at 18 months and weigh 550-1250 g at maturity, females mature at 12 months and weigh 550-1000 g at maturity. Both sexes are promiscuous and no pair bonds are formed. Longevity is about 5 years in the wild (Macdonald et al. 2002). Mustela vison (American mink) was widely farmed for its fur throughout the twentieth century, and this continues today in some countries. Mustela vison (American mink) are semi-aquatic inhabiting the boundaries of lakes, rivers, streams, coasts, esturies, wooded marshlands and swamps. Habitats with broad littoral zones, abundant cover and rockpools are particularly favoured In the UK, they will live near urban areas if there is sufficient cover and abundance of prey (Macdonald et al. undated). An existing cavity usually within 10 metres of water is nearly always used to provide a den site and several dens may be found within one home range. Mink are able climbers and may find dens in scrub, brush, tree roots, stones, hollow trees or rabbit burrows which they then elaborate and modify. Mink live individually and occupy home ranges that vary in size with the quality of the riparian habitat; home ranges vary from between 1 km and 6 km long (Dunstone, 1993, in Macdonald et al. undated). Mustela vison (American mink) are generalist, opportunistic predators that feed on small mammals such as rodents, water-birds, small invertebrates such as crustaceans, amphibians, reptiles and fish. In their native range they feed predominantly on muskrats and hares. In the United Kingdom mainland, they feed mainly on rabbits, brown rats and field voles (Dunstone 1993; Strachan and Jefferies 1996a; in MacDonald and Harrington 2003), while on offshore islands they concentrate on marine invertebrates, fish and birds (Helyar 2006). The proportion of mammals in their diet varies significantly with local availability and abundance. Diet may differ between individuals, sexes and seasons (MacDonald and Harrington 2003). On the mainland, rabbits are often the most important summer food, while in winter fish are more important prey, especially as many species become torpid and thus easier to catch when water temperatures are low. Near rivers mammals, fish and amphibians are the most important food resources, whereas near lakes birds and fish predominate (J'drzejewska et al. 2001; in Bartoszewicz and Zalewski 2003). In coastal habitats, gulls are the most common avian prey (Macdonald et al. undated). Mink will often kill more birds than they can eat, and will store the surplus to eat later, a habit displayed by many carnivores (Kruuk 1964; in MacDonald and Harrington 2003). They will feed on eggs, young and sometimes the adult birds. Chickens and gamebirds form less than 1% of the minks diet in south-west England (Macdonald et al., undated). In another study, which investigated the mink's diet during the birds' breeding season (March–September), it was found that Ralliformes (coots or moorhens) represented 10% of the ingested biomass of the minks diet, while rabbits represented 45%, fish 25% and small mammals 14%. Mink obtained 11% of their energy requirements from coots and moorhens (Ferreras and Macdonald 1999). Mustela vison (American mink) was introduced to Europe for fur farming, and spread due to accidental escapes and deliberate release. Recommended citation: Global Invasive Species Database (2019) Species profile: Neovison vison. Downloaded from http://www.iucngisd.org/gisd/species.php?sc=969 on 21-04-2019. Mustela vison (American mink) is a voracious predator which kills in excess of its needs due to the phenomenon of surplus killing. As a result an individual mink may decimate entire colonies of ground nesting birds (Clode 2002). Overall mink have large impacts on prey populations. The near extinction of the water vole (see Arvicola terrestris in IUCN Red List of Threatened Species) in the UK can attest to this. There is also evidence that mink could account for a large proportion of salmonid mortality in some river systems (Heggenes and Borgstrøm 1988, in CCS Undated). In Europe, mink predation has caused the decimation of seabird colonies and reduction of some waterfowl populations. For example, mink almost certainly have a serious adverse effect on the native biodiversity of the Western Isles (UK) and pose a threat to the many internationally important populations of ground-nesting birds. While terns and other seabirds are also impacted by mink predation the effect on riparian bird species is less clear but may potentially be high (Macdonald and Harrington 2003). Native rodents in South America are also affected (Woodroffe et al. 1990). The Mustelid family is well represented throughout the countries where American mink have been introduced. This invading species may therefore pose a risk to these species through competition for food and territories. Aggressive interactions between American mink and the highly endangered European mink (please see Mustela lutreola in IUCN Red List of Threatened Species) have been observed, with European mink often driven from their territories (Sidorovich and Macdonald 2001, in CCS Undated). American mink are not, however, the sole cause of the decline in European mink as many populations were in decline due to habitat loss and overhunting before their arrival. Polecat populations also appear to be have been negatively affected by the spread of American mink in Belarus (Sidorovich and Macdonald 2001, in CCS Undated, Maran et al. 1995). South American mustelids are also affected (Woodroffe et al. 1990). A recent survey (Mañas 2001) identified the presence of Aleutian mink disease parvovirus (ADV) in free-ranging mustelids including both the European and American mink and the Eurasian otter (please see Lutra lutra in IUCN Red List of Threatened Species ). American mink may also impact various economic sectors such as trout and salmon farms and hatcheries, poultry farms and sheep farms by preying on fish, chickens and farm birds and newborn lambs (Macdonald and Harrington 2003; Macdonald et al. Undated). European Centre for Disease Prevention and Control, Stockholm, Sweden identifies mustelids (including ferrets, mink and wild mustelids) among cats, dogs, horses, humans, marine mammals and pigs as propagating hosts of influenza viruses (those species that are infected by a particular influenza, where it seems that the viruses are better adapted and are transmitted). Some influenza types that infect mustelids are H3N2, H10N4 and H5N1 viruses (EuroSurveillance 2006). The population size of introduced Mustela vison (American mink) in some countries is so large that that complete eradication, without re-invasion from neighbouring countries or from fur farm escapes, is thought to be virtually impossible (CCS Undated). Detailed knowledge of population sizes and distribution is lacking for most countries in which American mink have established. In the UK, mink are widespread along waterways and around the coast, and the population size has been estimated at over 110,000 (± 55,000; source: JNCC). However, there have been successful mink eradication programs on some islands where re-invasion is easier to control and seabirds have re-colonised nesting sites following mink control in Scotland. A proposal to eradicate mink from the Western Isles in Scotland by Central Science Laboratories (York) and Scottish Natural Heritage is currently being funded by the EU and other countries are addressing the feasibility of carrying out similar eradication schemes (Moore et al. 2003). Macdonald and Harrington (2003) suggest a holistic approach to mink management, involving mink removal, habitat restoration, and the recovery of native competitors. It is necessary to ask whether control can be achieved on any geographical scale, how long term the effects will be, and what the costs would be in terms of either money or animal welfare (Reynolds et al. 2004). The return of the larger otter could be an important component of mink control in the UK as otters are hostile and detrimental towards the American mink (Macdonald and Harrington 2003). In Denmark the focus has been on prevention of mink escape from farms. In Finland, dogs are used to locate the mink and then an air-blaster is used to flush them out. In some areas of conservation importance, or for the protection of livestock, exclusion using mink-proof fences may be the most effective tool. Various types of repellent may also be used (Baker and Macdonald 1999; in Macdonald and Harrington 2003). \r\nRemoval of minks by live trapping is a successful method of control. In areas where native mustelids live selective killing procedures may be necessary. Bait containing mink scent glands has been found to be particularly successful (Roy et al. In Press), as mink, like other mustelids, communicate via scent deposition.. The expense of such an operation at a large scale may be prohibitive but this method has been successfully used in the Western Isles (UK), Belarus and on Hiiumaa Island in Estonia (where the mink was eradicated) (Macdonald and Harrington 2003). Modelling excerises have predicted that 60% of mink removed need to be juveniles or sub-adults in order to significantly impact mink numbers. The timing of mink control is also important; at the end of summer mink that remain are sometimes regarded as a \"doomed surplus\" and thus their removal would entail a waste of culling effort. Informations on Neovison vison has been recorded for the following locations. Click on the name for additional informations. Bonesi, L. and Macdonald, D.W. 2004. Evaluation of sign surveys as a way to estimate the relative abundance of American mink (Mustela vison), Journal of Zoology 262: 65-72. Summary: This study looks at the use of sign (scats and footprints) as a reliable and efficient method to estimate the relative abundance of the American mink (Mustela vison). Bonesi, L. and Macdonald, D.W. 2004. Impact of released Eurasian otters on a population of American mink: a test using an experimental approach. Oikos. 106: 9-18. Summary: This paper discusses the results of an experiment releasing otters into areas inhabited by American mink in the United Kingdom. It was found that otters have a dramatic effect on the distribution and density on the mink population. Centre for Conservation Science (CCS)., Undated. Control of North American mink outside their native range. Council of Europe. 2002. Workshop on invasive alien species on European islands and evolutionary isolated ecosystems: Proceedings. Convention on the conservation of European wildlife and natural habitats. Document prepared by the Directorate of Culture and of Cultural and Natural Heritage. Summary: This document outlines a number of key issues regarding invasive alien species in Europe. Desholm, M., Christensen, T.K., Scheiffarth, G., Hario, M., Andersson, �., Ens, B., Camphuysen, C.J., Nilsson, L., Waltho, C.M., Lorentsen, S-H., Kuresoo, A., Kats, R.K.H., Fleet, D.M. and Fox, A.D. 2002. Status of the Baltic/Wadden Sea population of the Common Eider Somateria m. mollissima. Wildfowl. 53: 167-203. Summary: This articles outlines the status of the eider duck population in northern Europe, and outlines possible reasons for an apparent decline, including the presence of American mink. EuroSurveillance 2006. Influenza team. H5N1 infections in cats � public health implications. 11(4):E060413.4. Summary: This paper gives details of the eradications of introduced species in Europe, including the eradication of M. vison from Hiimaa Island in Estonia. Gillies, C. and Williams, D. Undated. Using tracking tunnels to monitor rodents and mustelids. Summary: This paper gives detailed information about how to use tracking tunnels. Summary: This PhD discusses the presence of American mink in Denmark, and outlines some management options. Hebridean Mink Project. Bulletin February 2004. Summary: This newsletter gives information and news updates on the project which aims to control and eradicate American mink in the Western Isles of Scotland. Hebridean Mink Project. Bulletin May 2004. Huckle, Jon., 2002. Fact Sheet: TA/M/09: Invasive Alien Terrestrial Animal Species Mustela vison (Schreber, 1777) American Mink. Hudson, P. and Cox, R. 1998. Mink problems in the Outer Hebrides: a pilot study, Game Conservancy Annual Review: 133-135. Lariviere, S., Walton, L.R. and Virgl, J.A. 2000. Field anesthesia of American Mink, Mustela vison, using halothane, Canadian Field-Naturalist 114(1): 142-144. Summary: A look at the use of halothane for the anesthesia of American Mink for capture-recapture operations. MacDonald, D.W. and Harrington, L.A. 2003. The American mink: the triumph and tragedy of adaptation out of context. New Zealand Journal of Zoology. 30: 421-441. Summary: This article details the history of American mink invasions in Europe and South America, and discusses management options. Macdonald, D.W., Tattersall, F.H., Johnson, P.J., Carbone, C., Reynolds, J.C., Langbein, J., Rushton, S.P. and Shirley, M.D.F. Undated. Management and control of populations of foxes, deer, hares, and mink in England and Wales, and the impact of hunting with dogs. A report to the committee of inquiry into hunting with dogs. Summary: This extensive document outlines the history of mink control in the United Kingdom, and gives recommendations for future management options. Moore, N.P., Roy, S.S. and Helyar, A. 2003. Mink (Mustela vison) eradication to protect ground-nesting birds in the Western Isles, Scotland, United Kingdom. New Zealand Journal of Zoology. 30: 443-452. Summary: This article discusses the impacts of American mink in the Western Isles of Scotland, and the project which is in place to eradicate and control them. Nordstr�m, M. and Korpim�ki. 2004. Effects of island isolation and feral mink removal on bird communities on small islands in the Baltic Sea. Journal of Animal Ecology. 73: 424-433. Summary: This paper discusses the results of mink removal from some islands in Archipelago National Park in south-west Finland. Nordstrom, M., Hogmander, J., Laine, J., Nummelin, J., Laanetu, N. and Korpimaki, E. 2003. Effects of feral mink removal on seabirds, waders and passerines on small islands in the Baltic Sea. Proulx, G. and Barrett, M.W. 1991. Evaluation of the Bionic Trap to Quickly Kill Mink (Mustela Vison) in Simulated Natural Environments, Journal of Wildlife Diseases 27(2): 276-280. Summary: This study tests the effectiveness of the Bionic(R) trap. Reynolds, J.C., Short, M.J. and Leigh, R.J. 2004. Development of population control strategies for mink Mustela vison, using floating rafts as monitors and trap sites. Biological Conservation. 120: 533-543. Summary: This study looked at various management techniques for American mink in the Avon catchment in the UK, and presented a new method of trapping using rafts. Yamaguchi, N. and Macdonald, D.W. 2001. Detection of Aleutian disease antibodies in feral American mink in southern England, Veterinary Record 149 Abstract (16): 485-488. Summary: Fourteen of 27 American mink (Mustela vison) trapped in the upper Thames region were positive for anti-Aleutian disease antibodies. This occurrence of the Aleutian disease parvovirus (ADV) in a feral American mink population suggests that it could threaten populations of at least two protected mustelids, the otter (Lutra lutra) and the polecat (Mustela putorius), and may also play a role in the apparent decline of local mink populations in Britain. Yamaguchi, N., Rushton, S. and Macdonald, D.W. 2003. Habitat preferences of feral American mink in the Upper Thames, Journal of Mammalogy 84(4): 1356-1373. Summary: This study looks at habitat use by members of a wild population of American mink (Mustela vison) that were live trapped and radiotracked year round in the Upper Thames region, United Kingdom. Banks, P. B., Norrdahl, K., Nordstrom, M. and Korpimaki, E. 2004. Dynamic impacts of feral mink predation on vole metapopulations in the outer archipelago of the Baltic Sea, Oikos 105(1): 79-88. Summary: This study examines the factors that determine the distribution and abundance of vole metapopulations preyed upon by feral American mink Mustela vison in the outer Finnish archipelago of the Baltic Sea. Summary: This study reports on an investigation of the response of water voles to the odours of predators (American mink, Mustela vison, and brown rat) in outdoor enclosures. Barreto, G. R. and Macdonald, D. W. 2000. The decline and local extinction of a population of water voles, Arvicola terrestris, in southern England, Zeitschrift Fur Saugetierkunde-International Journal of Mammalian Biology 65(2): 110-120. Summary: A colony of water voles occupying 1.6 km of the river Windrush (England) is described before it disappeared due to mink predation. Bartoszewicz, M. and Zalewski, A. 2003. American mink Mustela vison diet and predation on waterfowl in the Slonsk Reserve, western Poland. Folia Zool.. 52 (3): 225-238. Summary: This article outlines the impact the American mink has had on waterfowl population at Slonsk Reserve in western Poland since their arrival in the 1990s. BenDavid, M. 1997. Timing of reproduction in wild mink: The influence of spawning Pacific salmon, Canadian Journal of Zoology-Revue Canadienne De Zoologie 75(3): 376-382. Summary: This study investigates the timing of reproduction and body condition of wild, free-ranging mink on Chichagof Island, southeast Alaska, in particular testing the hypothesise that availibility of spawning Pacific salmon (Onchorhynchus sp.) determines the timing of breeding in this population of mink. BenDavid, M., Bowyer, R.T. and Faro, J.B. 1996. Niche separation by mink and river otters: Coexistence in a marine environment, Oikos 75(1): 41-48. Summary: This study looks at habitat use and niche separation by mink (Mustela vison) and sympatric river otters (Lutra canadensis) at a coastal site in Prince William Sound, Alaska. BenDavid, M., Hanley, T.A., Klein, D.R. and Schell, D.M. 1997. Seasonal changes in diets of coastal and riverine mink: The role of spawning Pacific salmon, Canadian Journal of Zoology-Revue Canadienne De Zoologie 75(5): 803-811. Summary: This paper looks at diets of riverine and coastal mink (Mustela vison) in southeast during different seasons. Bevanger, K. and Henriksen, G. 1995. The Distributional History and Present Status of the American Mink (MustelaVison Schreber, 1777) in Norway, Annales Zoologici Fennici 32(1): 11-14. Summary: An overview of the farming and introduction into the wild of the American mink Mustela vison throughout mainland Norway and its offshore islands. Bonesi, L. and Macdonald, D.W. 2004. Differential habitat use promotes sustainable coexistence between the specialist otter and the generalist mink, Oikos 106(3): 509-519. Summary: In this paper differential habitat use was analysed as a potential mechanism for the coexistence of two competing riparian mammals, the specialist and dominant Eurasian otter (Lutra lutra) and the generalist and sub-ordinate American mink (Mustela vison). Bonesi, L., Chanin, P. and Macdonald, D.W. 2004. Competition between Eurasian otter Lutra lutra and American mink Mustela vison probed by niche shift, Oikos 106(1): 19-26. Summary: This investigation looks at interspecific competition between the American mink (Mustela vison) and the Eurasian otter (Lutra lutra) and the diet shift of M. vison. Bonesi, L., Dunstone, N. and O Connell, M. 2000. Winter selection of habitats within intertidal foraging areas by mink (Mustela vison), Journal of Zoology 250: 419-424. Summary: This study investigates habitat selection by American mink Mustela vison at a coastal environment in Scotland. It also looks at foraging selection factors and competition with the otter Lutra lutra. Brzezinski, M. and Marzec, M. 2003. Correction factors used for estimating prey biomass in the diet of American mink Mustela vison, Acta Theriologica 48(2): 247-254. Summary: A feeding trial on feral mink Mustela vison was carried out to find the differences in digestibility of particular prey types. The use of evaluated correction factors enables more accurate estimates of the food composition of wild living mustelids. Brzezinski, M. and Marzec, M. 2003. The origin, dispersal and distribution of the American mink Mustela vison in Poland. Acta Theriologica. 48 (4): 505-514. Summary: This articles details the spread of American mink through Poland, and gives some details of its impacts. Brzezinski, M. and Zurowski, W. 1992. Spring Diet of the American Mink Mustela Vison in the Mazurian and Brodnica Lakelands, Northern Poland, Acta Theriologica 37(1-2): 193-198. Summary: An analysis of 110 American mink (Mustela vison) faeces, which shows a great diversity in the food eaten and confirms the mink as a generalistic predator. Bueno, F. 1996. Competition between American mink Mustela vison and otter Lutra lutra during winter, Acta Theriologica 41(2): 149-154. Summary: This study looks at the diet of American mink Mustela vison and otter Lutra lutra and their shared occupation of two Mediterranean rivers in Spain. Bunn, A.G., Urban, D.L. and Keitt, T.H. 2000. Landscape connectivity: A conservation application of graph theory, Journal of Environmental Management 59(4): 265-278. Carter, S.P. and Bright, P.W. 2003. Reedbeds as refuges for water voles (Arvicola terrestris) from predation by introduced mink (Mustela vison), Biological Conservation 111(3): 371-376. Summary: This radiotagging study tests the hypothesis that reedbeds offer a refuge for the water vole from predation by the introduced American mink (Mustela vison). Clode, D. and Macdonald, D.W. 1995. Evidence for Food Competition between Mink (Mustela Vison) and Otter (Lutra Lutra) on Scottish Islands, Journal of Zoology 237: 435-444. Summary: This study investigates food competition between American mink and otters in the Scottish Islands. Clode, D. and MacDonald, D.W. 2002. Invasive predators and the conservation of island birds: the case of American Mink Mustela vison and terns Sterna spp. in the Western Isles, Scotland, Bird Study 49: 118-123. Summary: This study looks at the effect of mink on the colony size and breeding success of terns in the Western Isles, Scotland. Clode, D., Birks, J.D.S. and Macdonald, D.W. 2000. The influence of risk and vulnerability on predator mobbing by terns (Sterna spp.) and gulls (Larus spp. ), Journal of Zoology 252: 53-59. Summary: This study investigates the behaviour of terns (Sterna spp.) and gulls (Larus app.) to the introduced mink (Mustela vison), the native otter (Lutra lutra) and the rabbit (Oryctolagus cuniculus), in particular anti-predator mobbing. Clode, D., Haliwell, E.C. and Macdonald, D.W. 1995. A comparison of body condition in riverine and coastal mink (Mustela vison), Journal of Zoology 237: 686-689 . Craik, C. 1997. Long-term effects of North American mink Mustela vison on seabirds in western Scotland. Bird Study. 44 (3): 303-309. Summary: This paper discusses the impacts of American mink on seabird populations in the Western Isles of Scotland. Cranswick, P. Undated. Status and distribution of common scoter Melanitta nigra and velvet scoter M. fusca in the United Kingdom. The Wildfowl and Wetlands Trust. Summary: This paper outlines the status of the common and velvet scoter in the United Kingdom, and outlines American mink as one of the threats to populations. Cuthbert, J.H. 1973. The origin and distribution of feral mink in Scotland, Mammal Review 3: 97-103. Debiles, M., Clavero, M., Prenda, J., Bl�zquez, M.C. and Ferreras, P. 2004. Potential impact of an exotic mammal on rocky, intertidal communities of northwestern Spain. Biological Invasions. 6: 213-219. Delibes, M., Clavero, M., Prenda, J., Bl�zquez, M.C. and Ferreras, P. 2004. Potential impact of an exotic mammal on rocky, intertidal communities of northwestern Spain. Biological Invasions. 6: 213-219. Delibes, M., Travaini, A., Zapata, S.C. and Palomares, F. 2003. Alien mammals and the trophic position of the lesser grison (Galictis cuja) in Argentinean Patagonia. Canadian Journal of Zoology. 81: 157-162. Summary: This paper mentions the interactions between the American mink and native carnivores and rodents in South America. Drever, M. 2002. Important bird area conservation plan for the Scott Islands. Canadian Nature Federation. Summary: This paper gives details about the presence of American mink in the Scott Islands, British Columbia, Canada. Dunstone, N. 1993. The Mink. London: T. & AD Poyser Limited. Ferreras, P. and Macdonald, D.W. 1999. The impact of American mink Mustela vison on water birds in the upper Thames, Journal of Applied Ecology 36(5): 701-708. Summary: The effect of mink predation on water birds during the breeding season on the upper Thames river, England, was investigated. Ferreras, P. and MacDonald, D.W. 1999. The impact of American mink Mustela vison on water birds in the Upper Thames. The Journal of Applied Ecology. 36 (5): 701-708. Summary: This studied looked at the impacts of the American mink on coot and moorhen populations in southern Britain. Fournier-Chambrillon, C., Aasted, B., Perrot, A., Pontier, D., Sauvage, F., Artois, M., Cassiede, J.M., Chauby, X., Dal Molin, A., Simon, C. and Fournier, P. 2004. Antibodies to aleutian mink disease parvovirus in free-ranging European mink (Mustela lutreola) and other small carnivores from Southwestern France, Journal of Wildlife Diseases 40(3): 394-402. Summary: The role of the Aleutian disease parvovirus (ADV) in the decline of the endangered European mink (Mustela lutreola) in France was tested through a serologic survey. The association of the disease with the American mink is supported by the results. Fournier-Chambrillon, C., Berny, P.J., Coiffier, O., Barbedienne, P., Dasse, B., Delas, G., Galineau, H., Mazet, A., Pouzenc, P., Rosoux, R. and Fournier, P. 2004. Evidence of secondary poisoning of free-ranging riparian mustelids by anticoagulant rodenticides in France: Implications for conservation of European mink (Mustela lutreola), Journal of Wildlife Diseases 40(4): 688-695. Summary: Concentrations of eight anticoagulant rodenticides were examined in the livers of four species of free-ranging mustelids in France in this study. Anticoagulant poisoning could increase the vulnerability of the endangered European mink (Mustela lutreola) to other causes of death. Green, R. and Green, J. 2004. Information Sheet. Natural Heritage Trends, Fresh Waters: American Mink (Mustela vison). Information Note Series. Scottish Natural Heritage. Summary: This information sheet gives general information about the American mink in Scotland. Halliwell, E.C. and Macdonald, D.W. 1996. American mink Mustela vison in the Upper Thames catchment: Relationship with selected prey species and den availability, Biological Conservation 76(1): 51-56. Summary: This study tests the correlation between prey abundance and American mink abundance at sites in the Upper Thames, England. It also looks at the correlation between mink presence and Water vole Arvicola terrestris presence. Hammersh�j, M., Thomsen, E.A. and Madsen, A.B. 2004. Diet of free-ranging American mink and European polecat in Denmark, Acta Theriologica 49(3): 337-347. Summary: Stomach and intestine contents of American mink Mustela vison in Denmark is analysed in this study. Jaksic, F.M. 1998. Vertebrate invaders and their ecological impacts in Chile. Biodiversity and Conservation. 7: 1427-1445. Summary: This article gives information on invasive vertebrates in Chile, including the American mink. Jedrzejewska, B., Sidorovich, V.E., Pikulik, M.M. and Jedrzejewski, W. 2001. Feeding habits of the otter and the American mink in Bialowieza Primeval Forest (Poland) compared to other Eurasian populations, Ecography 24(2): 165-180. Summary: Diets of the otter Lutra lutra and the American mink Mustela vison from river habitats were studied in Poland. Kauhala, K. 1996. Distributional history of the American mink (Mustela vison) in Finland with special reference to the trends in otter (Lutra lutra) populations, Annales Zoologici Fennici 33(2): 283-291. Summary: An overview and comparison of the distributional history of the American mink (Mustela vison) and otter (Lutra lutra) populations in Finland. Lance, E.W. 2002. Montague Island vole: a conservation assessment. Gen. Tech. Rep.PNW-GTR-542. Portland, OR: U.S. Department of Agriculture, Forest Service, Pacific NorthwestResearch Station. 14 p.
Summary: This article discusses the current status of the Montague Island vole, and also mentions the presence of American mink on Montague Island. Lindell, L., Welander, B. and Dahlfors, S. Undated. Important bird areas in Europe - Sweden. Summary: This details the threats to bird populations in the important bird areas of Sweden, one of which includes the American mink. Lizarralde, M.S. and Escobar, J. 2000. Mam�feros ex�ticos en la Tierra del Fuego. Ciencia Hoy 10. Long, John L., 2003. Introduced Mammals of the World. CABI Publishing. 589 pp. Loukmas, J.J. and Halbrook, R.S. 2001. A test of the mink habitat suitability index model for riverine systems, Wildlife Society Bulletin 29(3): 821-826. Summary: A mink habitat assessment of 18 streams in the Lake Michigan and Superior basins of Wisconsin was carried out to test the accuracy of the United States Fish and Wildlife Service s mink habitat suitability index (HSI). Ma�as, S., Ce�a, J.C., Ruiz-Olmo, J., Palazon, S., Domingo, M., Wolfinbarger, J.B. and Bloom, M.E. 2001. Aleutian mink disease parvovirus in wild riparian carnivores in Spain. Journal of Wildlife Diseases. 37 (1): 138-144. Summary: This study investigates the possible role of transmission of Aleutian mink disease parvovirus (AVD) by American mink in the decline of the European mink. Macdonald, D.W., Sidorovich, V.E., Anisomova, E.I., Sidorovich, N.V. and Johnson, P.J. 2002. The impact of American mink Mustela vison and European mink Mustela lutreola on water voles Arvicola terrestris in Belarus, Ecography 25(3): 295-302. Summary: This study tests the hypothesis that American mink (Mustela vison) have reduced water vole (Arvicola terrestris) populations in Belarus at sites located in pristine unmanaged wetland ecosystems. Macdonald, D.W., Sidorovich, V.E., Anisomova, E.I., Sidorovich, N.V. and Johnson, P.J. 2002. The impact of American mink Mustela vison and European mink Mustela lutreola on water voles Arvicola terrestris in Belarus. Ecography. 25: 295-302. Summary: This paper discusses the interactions between American mink, European mink and the water vole in Belarus since the introduction of American mink in the 1990s. Maran, T., Kruuk, H., Macdonald, D.W. and Polma, M. 1998. Diet of two species of mink in Estonia: displacement of Mustela lutreola by M. vison, Journal of Zoology 245 : 218-222. Summary: This paper reviews the evidence for the replacement of the European mink (Mustela lutreola) by the American mink (M. vison) in Estonia. Markov, N. Undated. Conservation of carnivores and ungulates species diversity in nature reservations of Urals region. MAB Young Scientists Award, Research Status Report. Summary: This document gives details about the introduction of the American mink to the Urals. Massoia, E. and Chebez, J. C. 1993. Mam�feros silvestres del Archipi�lago Fueguino. L.O.L.A., Buenos Aires. 261 pp. National Geographic Society, 1995. Wild Animals of North America. Washington, D.C. : National Geographic Society, c1995. 406 pp. Niemimaa, J. 1995. Activity Patterns and Home Ranges of the American Mink Mustela Vison in the Finnish Outer Archipelago, Annales Zoologici Fennici 32(1): 117-121. Summary: This paper discusses activity patterns and home ranges sizes for the American mink (Mustela vison) in southern Finland. Nordstrom, M., Laine, J., Ahola, M. and Korpimaki, E. 2004. Reduced nest defence intensity and improved breeding success in terns as responses to removal of non-native American mink, Behavioral Ecology and Sociobiology 55(5): 454-460. Summary: This study looks at the behaviour of colonies of arctic terns (Sterna paradisaea) in Finland in terms of defending their offspring against American mink (Mustela vison). Previtali, A., Cassini, M.H. and Macdonald, D.W. 1998. Habitat use and diet of the American mink (Mustela vison) in Argentinian Patagonia, Journal of Zoology 246: 482-486. Reid, F. & Helgen, K. 2008. Neovison vison. In: IUCN 2012. IUCN Red List of Threatened Species. Version 2012.2. Rozzi, R. and Massardo, F. 2002. Antecedentes de Biodiversidad y Sitios Prioritarios en la Comuna Cabo de Hornos: Recopilaci�n de Informaci�n sobre los Ecosistemas Subant�rticos en Apoyo a la Estrategia Nacional y Plan de Acci�n para la Biodiversidad. Informe T�cnico. Comisi�n Nacional del Medio Ambiente XII Regi�n, Punta Arenas, Chile. Rozzi, R. and Sherriffs, M.F. 2003. El vis�n (Mustela vison Schreber, Carnivora: Mustelidae), un nuevo mam�feros ex�tico para la Isla Navarino. Anales del Instituto de la Patagonia 31:97-104. Rozzi, R., Massardo, F., Berghoefer, A., Anderson, C., Berghoefer, U. and Araya, P. 2004. Documento Base para la Incorporaci�n del Territorio Insular del Cabo de Hornos a la Red Mundial de Reservas de Biosfera. Programa MaB - UNESCO. 173 pp. Rushton, S.P., Barreto, G.W., Cormack, R.M., Macdonald, D.W. and Fuller, R. 2000. Modelling the effects of mink and habitat fragmentation on the water vole, Journal of Applied Ecology 37(3): 475-490. Summary: This study tests a number of aspects of the decline of the water vole (Arvicola terrestris) in the UK due to the introduced American mink (Mustela vison) with a focus on water vole conservation and habitat restoration on the River Windrush. SAG. 2001. Cartilla para Cazadores. Subdepartamento de Vida Silvestre, Departamento de Protecci�n de Los Recursos Naturales Renovables, Servicio Agr�cola y Ganaderso. Santiago de Chile. 99 pp. Sidorovich, V.E., MacDonald, D.W., Pikulik, M.M. and Kruuk, H. 2001. Individual feeding specialization in the European mink, Mustela lutreola and the American mink, M. vison in north-eastern Belarus, Folia Zoologica 50(1): 27-42. Summary: Individual feeding behaviour of the European mink Mustela lutreola and American mink M. vison inhabiting the upper reaches of the Lovat river, Belarus was investigated. Resource competition between the European mink and the naturalised American mink is discussed. Summary: This study compare body sizes of the European mink (Mustela lutreola), the polecat (M. putorius) and the American mink (M. vison) over a 10-year period in Belarus, before and after the invasion by American mink. Data is presented and discussed with respect to interspecific interactions. Torres-Mura, J.C. 2004. Fauna del Archipi�lago Fuegino y el Cabo de Hornos. Informe � FDI CORFO, Fundaci�n EuroChile. Santiago, Chile. Walday and Kroglund, undated. Europe s biodiversity - Biogeographical regions and seas: Seas around Europe - The Baltic Sea. European Environment Agency. Summary: This paper discusses the environmental state of the Baltic Sea, including invasive species such as the American mink. Woodroffe, G.L., Lawton, J.H. and Davidson, W.L. 1990. The impact of Feral Mink Mustela vison on Water Voles Arvicola terrestris in the North Yorkshire Moors National Park. Biological Conservation. 51: 49-62. Summary: This paper assesses the relationship between the spread of the American mink in the UK, and the associated decline in the water vole (Arvicola terrestris) population.